I found a frozen packet of nettles from last year's harvest in the freezer the other day. With all the fresh nettles we've been eating lately this seemed like an opportune time to see how a year-old hunk of frozen nettles tasted in comparison. I'm happy to report my dinner companions up the street didn't blink. Not for a second did they wonder whether my potluck contribution of Cream of Stinging Nettle Soup wasn't made from nettles picked that day (and I didn't tell—shhhh). The day-glo green color and signature flavor would have fooled me too. Score another point for free, nutritious food. Speaking of frozen nettles, I wouldn't have been able to make a soup with fresh nettles anyway because all of my harvest has gone into pesto production. There's a reason for this. She's four going on fourteen, cute as a button when she's not terrorizing her parents or building elaborate homes for ponies and princesses out of the furniture, and she loves her daddy's nettle pesto. I've already posted a recipe for Stinging Nettle Pesto, but here's more info/photos about putting up your pesto. Use a Ziploc with a corner cut off to fill each cavity of the tray, then put in the freezer for several hours. 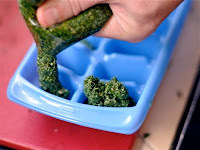 Once frozen the pesto cubes can be easily removed from the tray and stored in freezer bags, ready for use throughout the year. 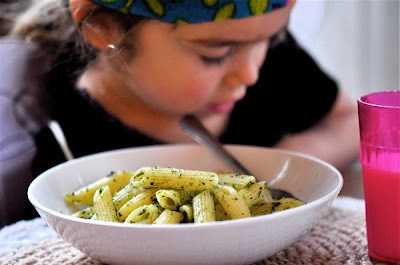 Whenever Ruby wants her pesto fix, I simply grab a pesto pop from the freezer, heat it up in the microwave, and toss with a bowl of cooked pasta. A single cube is enough to coat a few servings of pasta. If you want to make a large batch of nettle pesto just remember to harvest enough nettles. A grocery bag packed with freshly harvested stinging nettles yields about two ice trays of pesto plus a small tub. Few meals are healthier or easier to make. It’s a long time since I considered nettles as a food source and even then only two examples spring to mind. The first being the use of nettles in a sort of broth that we used to make using nettles but primarily whole sheep heads, eyes, brains and all. This rather smelly dish was not for the family but for the many racing greyhounds that were once trained by my father many years ago. The second use of nettles that I remember (rather more fondly) was the nettle wine made by my Nan along with a whole host of home produced foods ranging from jams, wines and preserves. Sadly, with the passing away of my Nan when I was still a shallow youth, this knowledge has been long lost. I look forward to the green shoots of spring, armed with knowledge that you have kindly shared, and the reintroduction of nettles to mine and Clare’s pallets. Good tip for freezing the pesto. I don't know if stinging nettles grow here in NJ but I need to find out. That's cool that they were still good and your taste testers could not tell the difference. BTW- here is my contribution to your Huckleberry Buckle challenge. Delicious looking pesto! I do the same thing with my nettles, except that I just quickly boil them to get rid of nitrates, and then freeze the leaves in icecube trays, to be used in any dish that I like. Nettle is my favourite plant! Did you know that it can be used to make yarn too? I am a pesto fiend and freeze tons of it every Septmeber for use during the years. Now nettles... I know they're here in MN- just don't know where. I'm heading down to the crick this weekend, weather permitting! I think I'll pack the sprog with me. Haven't decided. I don't want to accidentally upend him into a patch of cold mud and pain. I just picked nettles for pesto yesterday, & as you say - so delicious! I use coconut oil in addition to the olive oil, & used almonds I'd soaked ~ 6 hours. Freezing in ice cube tray is a great idea - thanks for sharing! & for those interested in nettle fiber - I picked up some 'Aloo' from Nepal at our local yarn shop - a coarse, traditionally processed nettle fiber! A 'bast fiber' plant, like hemp & flax, the fibers are as long as the stem (so up to 6'!) & the softer fibers need to be 'retted' off. It can be lovely fine yarn (Ramie is a nettle relative), or coarse & hardy! We once let nettle stems 'rot' on our lawn, but didn't proceed with the process. Murphyfish - Now that I've made blackberry wine it might be time to experiment with another prickly source. How much did Nan use in a batch? Enjoy your reintroduction into the world of nettles. It's worth the occasional sting. Ciao Chow Linda - I used to get stung by nettles every spring of my youth in CT, so I'm guessing you'll be able to find in NJ. Peabody - Haven't heard a peep from the neighbors so far. Guess they don't read the blog. goddessofcake - I freeze nettles too, in vacuum-sealed bags, usually in 2-cup amounts which is just right for soup. Claudia - As a pesto fiend you owe it to yourself to try nettle pesto. MN has plenty of nettles I'm guessing. Heather - Who knows, baptism by nettle might be just what the kiddo needs to cope with this world. Thanks for all the nettle information, we're starting to see a lot of the little green leaves in the Willamette valley. My girlfriend and I are trying our luck at nettle enchiladas today. Looking forward to picking up your book! Cool! We ate a mess o' nettles when I was a kid. This looks good. But the second-to-last photo looks like you (or possibly a ruminant) ate it two days ago. Oddly, it STILL looks good. A good post, good reminder. Thing is though we have more silverbeet than you can shake a stick at at this present time. But we could freeze them as you say. Ah, so delicious. I like the looks of your nettle gnocchi too. I made and blogged about some nettle pesto too recently (http://seattlelocalfood.com/2010/02/28/nettle-pesto-with-local-walnuts/) and it came out really well - I used some fresh walnuts a vendor had at the Ballard farmers' market. Someone commented that they'd had nettle pesto made without preblanching the nettles, that the food processor destroys the stingers too. Have you heard this?? It seems unlikely to me, and I'm really content with the flavor of the pesto from cooked netles. It's the best pesto I've ever made.